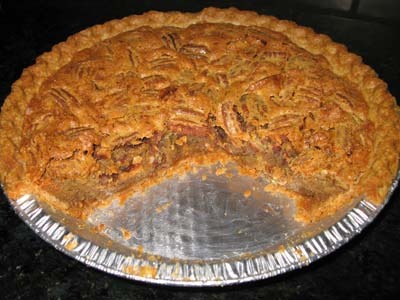 The recipe for this pecan pie came from a friend who preferred pecan pie made with no corn syrup. The texture is not quite as loose as a corn syrup pecan pie, but I wouldn’t call it dry, either. It’s a bit sweeter, but not overly sweet or cloying. Easiest Ever Pecan Pie may not really be the easiest, but it's pretty simple. No corn syrup required! Toast pecans using whatever method you prefer. I like to roast them at 350 for about 8 minutes, then chop them. Melt butter in saucepan and let cool slightly. In a mixing bowl, whisk together both sugars and flour. Whisk in eggs, evaporated milk and vanilla, followed by melted butter and toasted pecans. Pour into unbaked pie crust. Set on a cookie sheet and bake at 325 degrees for 50 minutes. Let cool completely. Surcie, yeah. PeCON or pee-kawn or even pikawn….anything is better than peeCAN. Pecans deserve better than to be called that. If I win a gift certificate to Williams Sonoma, I’ll have to try that pecan pie mix. Then again, it would ruin all my fun it the mix tasted better than scratch.Gina, don’t worry. There will be more pecan pie madness. I think I’m going to move into the realm of corn syrup (white and golden, no dark) pies next. Scotty, link away! I saw your pictures of the Epicurious cookies and they looked terrific. This sounds so good. I’m crazy about peCON pie. My favorite version is from a jar, believe it or not. Around the holidays, Williams Sonoma has been selling pecan pie filling. (I think all you add are eggs and a crust.) It’s made with madagascar vanilla as well as bourbon. They sell out of it really quickly, but once you try it, you’ll understand why.